Has Satan Fallen From Heaven? Does he still have access to the throne of God? According to the Bible, Satan still has access to heaven and God. The prediction of this judgment is for a yet future event to happen when Satan is cast down out of heaven to earth in the middle of the Tribulation. This passage does not teach that Satan was cast out of heaven at the time of his sin and as an immediate judgment for his sin. It just states the sentence that has been given to Satan which has not yet been meted out (kind of like a person on death row; they have already been sentenced to die, but the punishment has not happened yet). In this passage, no confusion is apparent about the appearance and presence of Satan among the other heavenly beings. This passage shows his position in heaven and also reveals that, in the days of Job, Satan was free to go and come into heaven from the earth. From this passage, we must conclude that Satan still had unchallenged access to the presence of God when Jesus was on earth. According to the Scriptures, throughout this age the believer must be prepared to war against spiritual beings of wickedness who have access to heaven. The evidence presented in this passage shows Satan is not yet cast out of heaven. There is another revelation concerning Satan’s present position in which it is declared that he now has access to earth as well as heaven, “Be sober, be vigilant; because you’re adversary the devil walks about like a roaring lion, seeking whom he may devour. 9Resist him, steadfast in the faith, knowing that the same sufferings are experienced by your brotherhood in the world” (1 Peter 5:8-9). From these passages it may be concluded that the position of Satan in heaven and his freedom to go to and fro in the earth has not changed since the days of Job. What Will Happen To Satan? This passage also teaches that Satan remains in heaven until the time described here. According to its context in the book of Revelation, this is a yet future time when, in the middle of the Great Tribulation, Satan will be finally banished from heaven (along with his demons) and will personally indwell the person of the Antichrist. Thus, there is no question concerning the sufficiency of the power of God over Satan. It is only a question as to when that power will be exercised. It is important to distinguish Satan’s yet future physical banishment out of heaven from his moral fall. He obviously fell morally at the moment of his refusal to obey God’s will for him, but his physical position throughout the ages until the Tribulation is in heaven. From this position, he has access to both God and to the earth. God’s final judgments against Satan are not yet executed. In like manner, God has not yet caused sin to cease in the earth; but the day is coming when He will. Also, Satan is still under God’s power; he cannot do anything without the knowledge and permission of God, hence Satan having to get permission from God to afflict Job in the Old Testament book of Job. Satan was the first being to manifest a will opposed to the will of God. Those passages from Isaiah state the sin of his pride, “I will ascend into heaven. I will exalt my throne above the stars of God. I will sit upon the mount. I will ascend above the heights of the clouds. I will be like the most High.” Satan seeks not to make a violent attack upon God’s throne, but to steal the hearts of the unfaithful in the kingdom and, through his lies and subtleties, gain a kingdom for himself. He would thus become an object of worship and attract attention from others to himself. It is apparent that pride was the first sin and thus pride is the sin from which all others stem from. Satan triumphed over the first Adam when he wrested the scepter of authority from man by securing man’s loyal obedience to his own suggestions and deception. This earthly scepter Satan held by full right, seemingly without challenge from the Lord, until the advent of the Last Adam. Christ is considered the “last Adam” because through his sacrifice, he undid the curse of sin (which was eternal spiritual death for all humankind), thus undoing the curse on all mankind which the first Adam introduced to the world through his sin. However victorious Satan may have been over the first Adam, it is certain that he met a complete and final judgment and sentence in the Last Adam. Referring to His sacrifice on the cross, Jesus said, “Now is the judgment of this world: now shall the prince of this world be cast out” (John 12:31). Still another scriptural testimony to this great defeat of Satan is recorded in Colossians 2:13-15 “13And you, being dead in your trespasses and the uncircumcision of your flesh, He has made alive together with Him, having forgiven you all trespasses, 14having wiped out the handwriting of requirements that was against us, which was contrary to us. And He has taken it out of the way, having nailed it to the cross. 15Having disarmed principalities and powers, He made a public spectacle of them, triumphing over them in it.” It is clear that though Satan may have triumphed over the first Adam and thus became the god and prince of this world, he himself was finally triumphed over and judged by the Last Adam on the cross. Wife and mother, and dedicated student of the Bible. 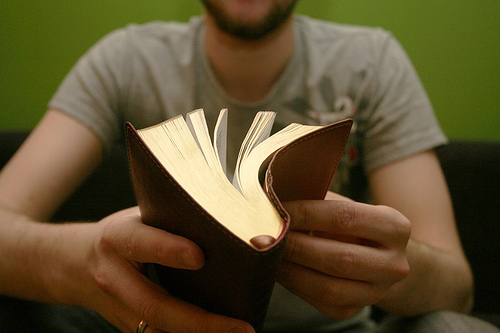 Why Should a Christian Read the Bible? Should Christian Women Cover Their Heads in Church?